A trade deficit is an amount by which the cost of a country's imports exceeds the cost of its exports. It's one way of measuring international trade, and it's also called a negative balance of trade. You can calculate a trade deficit by subtracting the total value of a country's exports from the total value of its imports. A trade deficit occurs when a country does not produce everything it needs and borrows from foreign states to pay for the imports. That's called the current account deficit. A trade deficit also occurs when companies manufacture in other countries. Raw materials for manufacturing that are shipped overseas to factories count as exports. The finished manufactured goods are counted as imports when they're shipped back to the country. 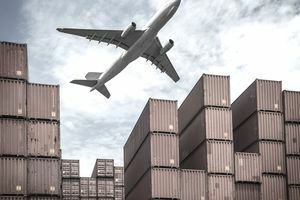 The imports are subtracted from the country's gross domestic product even though the earnings may benefit the company's stock price, and the taxes may increase the country's revenue stream. Initially, a trade deficit is not necessarily a bad thing. It can raise a country's standard of living because its residents gain access to a wider variety of goods and services for a more competitive price. It can also reduce the threat of inflation since it creates lower prices. A trade deficit may also indicate that the country's residents are feeling confident and wealthy enough to buy more than the country produces. Over time, however, a trade deficit can cause more outsourcing of jobs to other countries. As a country imports more goods than it buys domestically, then the home country may create fewer jobs in certain industries. At the same time, foreign companies will likely hire new workers to keep up with the demand for their exports. In the United States, the Bureau of Economic Analysis measures and defines the trade deficit. It defines U.S. imports as goods and services produced in a foreign country and bought by U.S. residents. It includes all goods shipped to the U.S., even if they're produced by an American-owned company. If a product goes through U.S. Customs and is intended to be sold in America, it is considered an import. Imports also include services. The BEA counts services purchased by U.S. residents while they are travelers in another country, including food, lodging, recreation, and gifts. It also counts travel, fares, and other passenger transportation tolls purchased while traveling. Other imported services include payment of royalties or license fees and payment for services. These services could include advertising, telecommunications, or education, to name just a few. In short, if the consumer is a U.S. resident and the provider is a foreign resident, then it is an import. An export is any good that passes through customs from the U.S. to be sold overseas. This includes merchandise shipped from an American-based company to its foreign affiliate or branch. Exports include services sold by a U.S. resident or U.S. business and bought by a foreign resident. The BEA estimates service imports and exports from benchmark surveys and other reports. The measurements of goods transactions come from the U.S. Census.